I cut an aperture in my base card with the large Fleur di lis die then cut it again in purple card and set it into the card. The topper is a very old stamp, one of the first I bought and I stamped and embossed it in gold and coloured with PM's, fussy cut it and popped it up on foam pads. The sentiment is a SeeDee one. Apologies for being late but we were at a funeral all day yesterday and didn't get home till late. Beautiful gold embossing and colouring, Val and those flowers look great on the lovely diecut. Serves you right.....hehe! So easy to do though. Anyway it's up and sorted now. Lovely card but your purple looks black in the photo. Really pretty flowers. 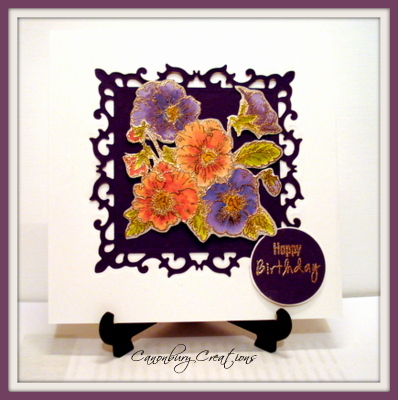 Fantastic card, love the beautiful coloured flowers. This is sooooo pretty Val. The fleur di Lis die cut makes a stunning back drop for the flowers.